We all loved cartoons as a kid. Hell we all love them now! What I’m going launching here on The Spaceman is a new series of articles looking at the story behind some of our favourite childhood cartoons. We’re going to start today with a look at a very topical cartoon – The Real Ghostbusters. The Ghostbusters are currently a big name again, not that they ever went away, with the reboots cinema release rapidly approaching and a new cartoon series in the works to be called Ghostbusters ECTO Force. The Real Ghostbusters ran for 140 episodes accross 7 series from 1986 to 1991. Perhaps the first issue we need to look at is the title. Why not just call it Ghostbusters? Well it turns out that there was already a kids show from 1975 called The Ghost Busters which was a live action sitcom that featured 2 guys and a bloke in a Gorilla costume who went around and supposedly caught ghost made by a company called Filmation. With the success of the 1984 Ghostbusters big screen movie, the one we all love, Filmation decided to revive that concept as a cartoon and produced 65 episodes called Ghostbusters in 1986 featuring a couple of guys and a gorilla fighting spooks. This Ghostbusters (now known as Filmation’s Ghostbusters to avoid confusion) was pretty damn awful. I remember asking for a Ghostbusters annual from my Nana as a kid and then wondering who the Gorilla was and where on earth was ECTO 1. 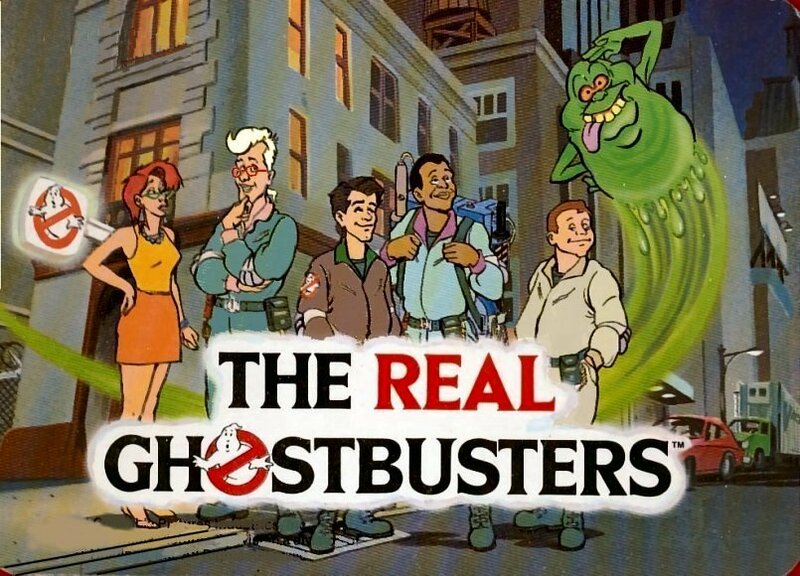 The Real Ghostbusters featured the characters from the film but in highly stylised animated form. Producer Joe Medjuck was also a producer on the 1984 movie so was the guy who they turned to to get the animated series off the ground. He hired designer and illustrator Jim McDermott who created the final designs of the characters and thus the designs of the toys I LOVED as a kid. Most cartoons of the 1980s were the product of one, or possibly two, companies. The Real Ghostbusters was by three. DiC Enterprises, a company who I’m sure we’ll hear more from in future articles as they made A LOT of cartoons, Columbia Pictures Television, which was the TV arm of the movie studio who made the original film, and Coca-Cola Telecomunications. That last one came as a surprise to me reading this article as I had no clue that Coke ever had a TV division let alone co produced cartoons! It turns out that Coke were also behind Hulk Hogan’s Rock ‘N’ Wrestling but we’ll not hold that against them. The Real Ghostbusters featured Maurice LaMarche, best known as The Brain from Pinky and The Brain, and many voices in Futurama, as Egon Spengler. Whilst asked not to do an impression of Harold Ramis, who played Egon in the film, he did one any way and that won him the part. He would go on to voice Egon for all seven seasons. Frank Welker voiced Ray Stantz. Welker is best known for being the regular voice of Megatron in the Transformers cartoons of the 1980s up to the most recent Transformers games and as being the only person to ever voice Fred Jones in the Scooby Doo franchise. The awesomely named Lorenzo Music voiced Peter Venkman in the first 2 series before being replaced by Dave Coulier. Music is best known as the voice of Garfield whom he voiced from 1982 up until his death in 2001. He was actually supposed to be voicing Garfield in the live action movie before being replaced by Bill Murray. The irony of that is that he was droped from The Real Ghostbusters for one of two reasons. Maurice LaMarche claimed it’s because Bill Murray, upon hearing the cartoon, felt that Venkman sounded far too much like Garfield the cat and demanded changes. Producer Joe Mudjuck claims it’s that they wanted Peter Venkman to sound more like he did in the films, therefore more like Bill Murray, and that’s why Dave Coulier took over. Dave Coulier is best known Stateside as a stand up comedian and one time Commission for indy wrestling company Chikira a position he held for two full years. Ernie Hudson, the original big screen Winston Zeddemore, auditioned to play the animated version and shockingly didn’t get the part. Quite why is lost to history but it still feels like a missed opportunity. Instead American Talk Show host Asenio Hall voiced him for the first 3 seasons before being replaced by Buster Jones. Buster Jones has provided voices in just about everything from Transformers to Batman The Animated Series. The first 2 seasons had the films signature mix of horror and humour down to perfection. This show could be genuinely creepy in places but it was also a hell of a lot of fun to watch. From series 3 onwards an effort was put in to make the tone lighter and by the final two seasons, with the introduction of film character Louis Tully, it little resembled how it had begun. Famed comicbook writer J.Micheal Straczynski, who also created TV shows Babylon5 and Sense8, and has written for TV shows as diverse as She-Ra to Walker Texas Ranger t0 Murder, She Wrote, was the story consultant for the first 6 seasons. Instead of making this show, like so many others, a cynical attempt to make kids want to buy toys he actually put a lot of love in to its writing. Characters from folklore, myth, and legend were all part of the ghosts the ‘Busters had to capture. The name drops were crazy! I often wonder if this show is what sparked my initial, and lifelong, curiosity for the paranormal. With each of these shows I’m going to pick out two stand out episodes that are worth a watch. Firstly Egon’s Ghost. In this episode Egon is hit with a stray blast of energy and finds himself trapped in the realm of the Ghosts. The story would’ve made a pretty awesome basis for a movie, never mind a cartoon, and it’s a great watch that I think does hold up today. Secondly the genuinely creepy The Boogieman Cometh. This one sees two kids enter the Ghostbusters Firehouse and offer the contents of their piggy bank to hire the Ghostbusters to fight the boogieman in their wardrobe. This ending really adds to the whole Ghostbusters mytholgy and is considered by some to even be film canon. I’ll not spoil the ending but it gives away just what drove one of our beloved ‘Busters to want to fight the paranormal. A final point I’m going to look at in this series is to see if there were any weirdness with regards to the how the cartoons were shown here in the UK. With The Real Ghostbusters it’s interstesting to note that we here in the UK only got the first two seasons aired during it’s original run and those two seasons were repeated pretty much constantly throughout the late 1980s. Season 1 consisted of 13 episodes and season 2 was 65 episodes long. That’s 78 episodes aired here of the 173 produced so near enough 100 episodes that were only available here when the complete series was released on DVD in 2007. I find that really weird that we Brits used to get such short shrift with shows like this. Having said that given the stylistic changes that occurred with this show from Season three onwards, venturing in to out and out horror, I can’t say I’m too upset. What’s also interesting is that this show was one of the few to escape something that happened to a lot of cartoons in the late 1980s and that was censorship. We’ll tackle that issue with the Teenage Mutant Hero Turtles as it’s a frankly bizarre one when looked at today. All in all it’s fair to say The Real Ghostbusters was one of the best cartoons of all time and spawned an interesting follow up series in the form of 1997’s Extreme Ghostbusters which is a show we’ll have a look at at a future date. If you’ve any suggestions for future cartoons you’d like me to cover feel free to leave them in the comments box below!